Welcome back to Urban Thinking. Returning from a long hiatus, new content will focus largely on home improvement projects, with the occasional urban design and development news post. A lot of exciting changes since my last posting: Emily and I got married in September of 2013, we got a cat, and last June (2014), we purchased our first home – a century-old house in Iowa City. I have thoroughly enjoyed home ownership so far and love investigating every nook and cranny. I’ve been especially interested in the history of the house and identifying what elements are original and what has been modified or added over the years. We spent about six months house hunting in Iowa City, starting in late 2013. Our goal was to find an older home with character in an established, walkable neighborhood close to downtown. We quickly realized this particular housing stock is very limited in Iowa City, as the vast majority of houses surrounding downtown have been converted to rental properties with proximity to the university. The occasional house that did come on the market tended to be well over our price range or did not satisfy enough of our requirements. 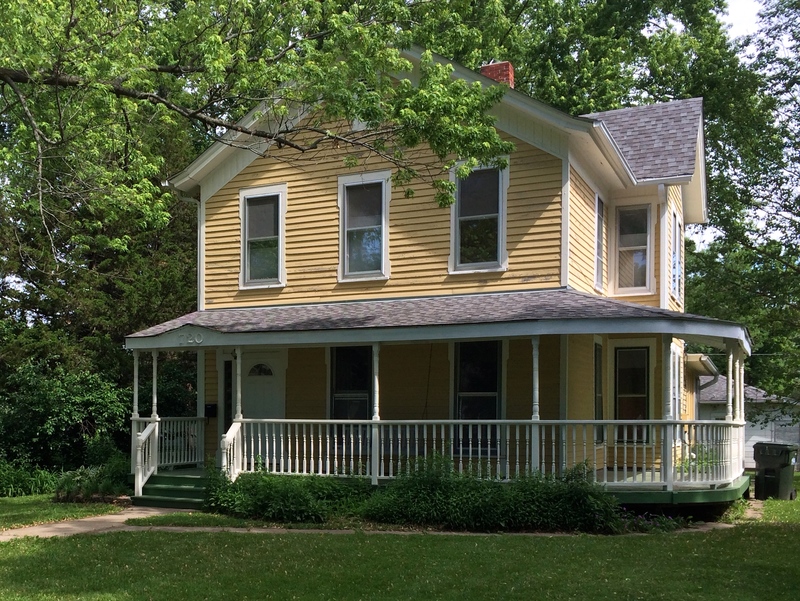 Finally, though, in mid April, we spotted a new listing: a quaint two-story yellow house with a wrap-around porch on Walnut Street, about a mile southeast of downtown. We saw it immediately and decided to put in an offer. The sellers accepted our first offer and we took possession at the beginning of June. While not quite a “fixer-upper” the house certainly had – and still has – many projects. Overall in good condition, deferred maintenance and upkeep in recent years was evident, as well as some unusual modifications over the decades when the house functioned as a rental property. That said, the owners before us actually did quite a few improvements to bring the house back to a more original condition, such as restoring original wood siding that had been covered in aluminum siding and removing carpet and ceramic tile from original hardwood floors. A significant new addition they made – a master bedroom suite built over a single-story kitchen on the back of the house – was done sensitively to match the scale and character of the original structure. A large deck with a small pergola was added to the backyard as well. These two features were by far the top selling points of the house. After moving in we focused on deep cleaning, getting the yard in better shape, and taking care of minor maintenance issues that had long been ignored. We repainted a few rooms (entry hallway, living room, and dining room) and gradually purchased much-needed furniture like a couch, dinning table, and dressers for our bedroom. I have an ever-growing list of long term projects (renovating the kitchen being the most extensive), but am still focused on maintenance issues and improving the performance of the house’s assembly and systems Admittedly I am more excited about the technical improvements than the aesthetic at times, but am trying to be methodical in the phasing of projects. Investing in the building envelope and HVAC system first will ensure a solid and protective foundation for the more fun, visible projects in the future. My subsequent house-related posts will go into further detail on some improvements I have already performed, and what I am working on now as we head into summer. I have found several home improvement blogs very interesting and informative and hope my new posts will be interesting, if not helpful to others as well. I started this blog in 2007, with a focus on architecture, urbanism, and public transit. Current posts will focus on home improvement projects and maintenance on my 115 year old house.